preparing these pdf. editions of the English and German versions. 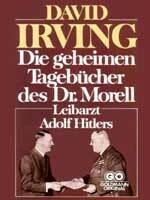 See also on this website: Morell's papers, "Die ärztliche Behandlung von Mussolini"
DOCUMENTS like this book are stored on this website in Adobe Acrobat (".pdf") format. This format allows viewers to access documents in their original published form. To read Acrobat documents, you must have Adobe's free Acrobat Reader: To download your free copy if you do not already have it use the menu above. It costs Mr Irving money to prepare these files, and each time you download one it costs us money too. Feel free to kick in. Use our help page to ensure we keep up this operation. If you have enjoyed a book download, what was it worth to you?